Pawan and Shwetha were overjoyed when they had their baby boy eight months ago. They named him Gautam Xavier, and he grew up to be a happy and seemingly normal child. When he showed symptoms of flu, they assumed it had to do with the weather, and consulted a doctor. Nothing could have prepared this family for the diagnosis – a congenital heart condition called TAPVC that can be corrected only with an open heart surgery. Gautam’s “flu” did not subside even with prescription medicine. 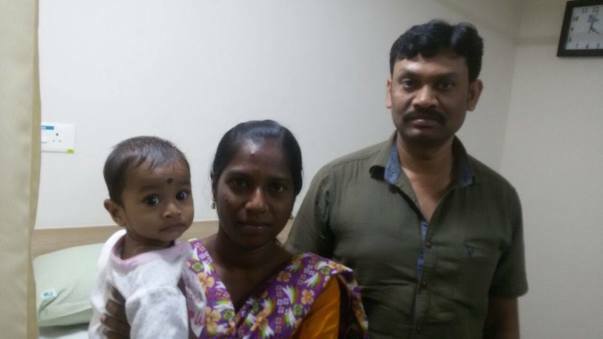 They family went back to their hometown, Kadapa, where Shwetha took him to a local doctor. After a few days of treatment, his cough was almost gone. Gautam’s grandmother doted over the child as he recovered. While patting him to sleep, she realized his heart was beating too fast and grew worried. They rushed him to the doctor again, and after a battery of tests, he was diagnosed with Total Anomalous Pulmonary Venous Connection. TAPVC is a rare condition where the veins carrying oxygen-rich blood from the lungs attach to the right side of the heart instead of the left. This means that the body gets poorly oxygenated blood, while the heart works harder to send more oxygen to all cells. In Gautam’s case, the condition went undetected at birth, and symptoms did not show until now. His parents finally understood why their child was always underweight and did not show normal development. 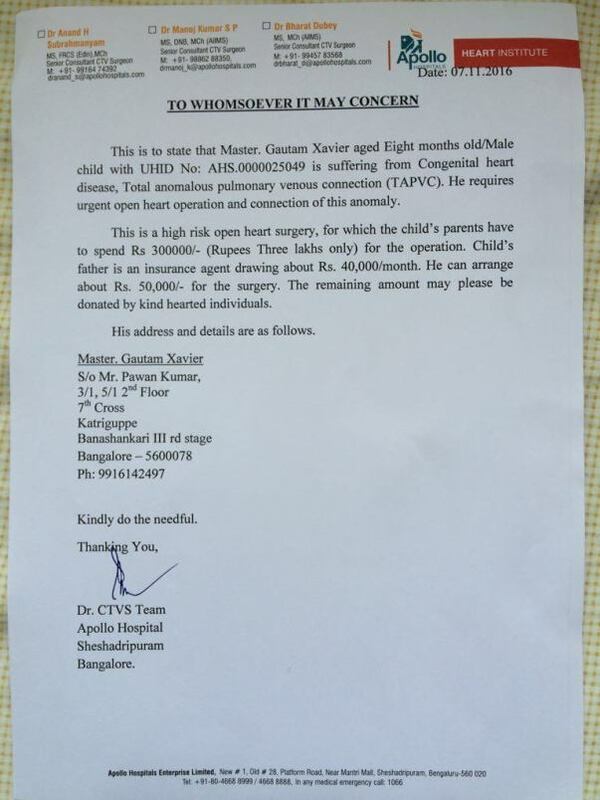 Gautam needs a risky open-heart surgery to correct the problem, and it must be done immediately as delaying could pose fatal consequences. Pawan is an insurance broker who has been simply trying to make his family feel comfortable with his earnings. At the end of the month, he hardly has about Rs. 5000 left to save. The surgery is estimated at Rs. 3,00,000, a large amount that Gautam cannot afford immediately. He cannot depend much on help from his immediate circle, and so, relied on charging the bill on his credit card, maximizing its Rs. 50,000 limit. Unfortunately, he does not have any insurance from his employer, nor can he opt for one right now to cover the medical expenses. This father now has a lot on his plate, and no options. Without the grandmother's timely inkling, it would have been impossible to detect this problem until it was too late. Xavier is now waiting for his surgery at Apollo Hospital, Sheshadripuram, Bangalore. Even after the surgery, he has a long road of recovery ahead of him. This is indeed a painful situation for the baby who cannot even voice out any discomfort he feels. His recovery would include taking it easy on physical activity, almost robbing him of a normal childhood. Your support can go a long way in saving Gautam’s life, easing the family’s troubles, and gifting him a pain-free childhood. All the specifics of this case have been verified with the concerned hospital. To know more about Gautam’s story, contact the campaign organizer. Hello everyone. Here is an update on Xavier’s health condition. Xavier was very brave during his surgery and he tolerated the surgery well. He was discharged on the post-op 5th day. He visited the hospital for his follow up checkup after 1 month which went well. Xavier is now at home and is doing well. We thank each one of you for your generous support. wishing for the healthy and long life of the child.